QIAA will be hiring more members at the start of the winter term. Check back here for updates. Alternatively, you can follow our Instagram, Twitter, or like our Facebook page. We look forward to seeing a set of fresh faces in the new year! Extended Executive - Reach out to campus and community organisations, create your own event, staff booths, bake, cook and participate throughout the week this February! Highlight your passion by join the Directors in making a great week for advocacy, learning and engagement! QNMUN Director General (1) - Lead and manage the staff of the inaugural high school MUN competitive conference. Working with a large budget and problem solving during the conference date. QICSIM Co-Chair (1) - Plan and run our interactive conference based on role playing and problem solving. Help with logistics, fiances and staff management of this unique conference. First-Year Intern (4) - Experience all of QIAA right away, having multiple responsibilities from attending weekly meetings to helping organize speaker series. Successful candidates will interact and learn with the major functions of QIAA. Website Designer (1) - Using a variety of software and domain hosts, develop and maintain QIAA's multiple websites. Graphics Designer (2) - Help the graphics team with processing requests from multiple initiatives or focus with work from one. Have creative freedom and use our software. QICSIM Research Director (1) - Develop the theme and interactive aspects of the conference, coordinating a team of researchers to craft a functional experience for attendees. QICSIM Marketing Director (1) - Promote the conference campus wide, as well as reaching out to potential external attendees. Use initiative's social media effectively to fill the demands of Co-Chairs and Research Director. QICSIM Researcher (6-8) - Create a background for an interactive committee, requiring to weave themes and cite information to craft a guide for conference attendees. Run the committee section you researched sometimes directly interacting with attendees. 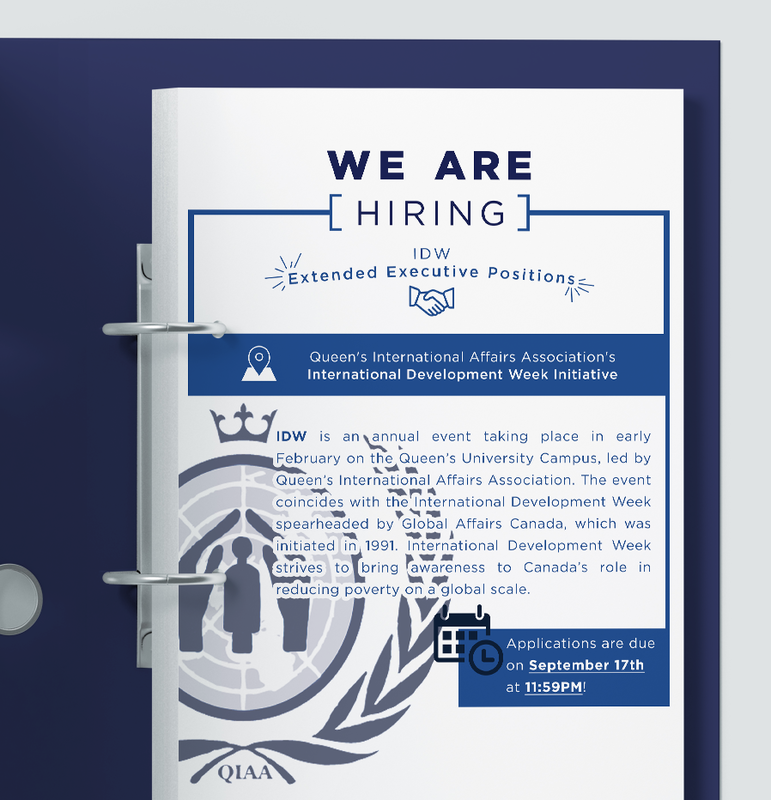 QNMUN Under-Secretary General (2) - Supervise and assist committee development, including hiring additional committee directors. Interact with conference delegates and report complaints and suggestions to the Secretary General. RoR Researcher (2) - Coordinate topics and make outline for episode content. Fact check, edit, and assist the Directors in making episode grounded in strong a base for interviewing guests and conducting debates. RoR Outreach Coordinator (1) - Manage requests for airtime, draft guest recommendations and make partnerships with campus and Kingston organisations. Intern - "Paid internship requires organizing CIDP speaker series, planning events, maintaining the social media pages, writing reports, assisting with newsletter production and more". Require a letter of interest, resume and an unofficial transcript, handed into the CIDP office. Contact us at cidp@queensu.ca or (613)533-2381 for more information. General Member - Debate, travel, staff conferences, participate in weekly meetings. Staff Writers - Regular contributors to the online and print publications. Staff Editors - Review and manage contributions as well as writing for either the online and print publications. Director of External Relations - "A Director of External Relations has a crucial role in the creation of interview questions and the direction in which a journalistic project is pursued by the Investigative Journalists, and most importantly, this position oversees and manages the Investigative Team". Director of Media - "The Director of Media manages the production of journalistic media (ex. interview clips, editorial comments, etc.) created by the Digital & Media Specialists and the Investigative Team to bolster and maintain The Observer brand".